The Waco Cultural Arts Fest is this weekend! To quote a friend of mine, "WHEEE! Art. Outside. For Free. And someone else cleans it up." 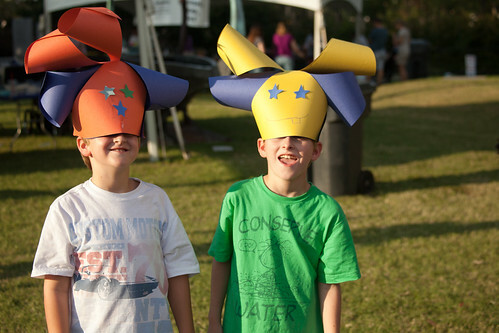 One of the craft they've had every year since I've gone are the fun crazy paper hats you see above. There will also be masks, easel art, clay, bubbles and more! Plus of course lots of arts and crafts to browse through! A great chance to get your Christmas shopping done early! (Oh, and if you want to hit two fun events in one day, you can stop by the weekly Downtown Farmer's Market that will be going on just a couple blocks down the street from the Arts Fest from 9:00 til 1:00 on Saturday). I am a writer for a website that covers everything in downtown Waco from events to dining to living to shopping. The URL is http://www.chisholmcrossing.com. Perhaps the most useful feature for Waco moms, are the highly interactive search fields, which allow you to search for kid friendly establishments and events happening around Waco. New features are being added to the site weekly, as it is still in development. We would love a link or simply a mention from your blog. We exist to develop community in downtown Waco and to draw awareness to all the wonderful things this city has going on. Thank you!